Not noticing that it’s festival season in Edinburgh is like not noticing a punch to the face, but if you haven’t, well, consider yourself told. 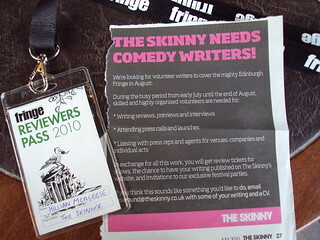 The Comely Banking Crisis will be doing the odd review for The Skinny here and there, posted up here. But before I go and inundate myself with plans, any suggestions for things to see for the rest of the fest would be much appreciated. I’ll be posting my reviews here, but you can also find them plus many more on The Skinny’s website. Here’s a review of Sarah Campbell’s show 27 Up. Honestly, it’s a great show. Four stars! 27 Up may be a free show but you can’t help but feel genuinely privileged to be in the room with Sarah Campbell as she takes the audience through one charming autobiographical anecdote after another. What begins as deceptively simple banter with the audience ends upcareering through everything from family to 1980s politics to sexuality, and not without a significant amount of uproarious laughter on the audience’s part. The concept, based on the Up television series, is a reflection on Campbell’s life at regular intervals, this show being the first in her 27 years. Needless to say, a second instalment is planned for 2037. This future perspective is central to the show: expect to be asked to communicate with the future audience (which may just include you, considering the show closes with each audience member receiving a free ticket for the sequel). Campbell’s sharp, conversational style and story-telling bring an atmosphere of intimacy and camaraderie to the venue. At 30 minutes, the show is a little short, but has abundant freshness and charm. You won’t get many more chances to see Sarah for free. Don’t let this one pass. Last night BBC4 aired the intriguing Lennon Naked drama, starring Christopher Eccleston as the man himself with Naoko Mori mainly standing around in the background playing Yoko Ono standing around in the background. Billed as part of the BBC’s Fatherhood season, the drama is set around various real and fictive family settings from the Beatles to John’s first family, showing, er, their ultimate demise. It’s no surprise that two key relationships highlighted are John’s with his father Alfred and John’s with his first son, poor old Julian Lennon. In this respect last night’s feature had something sort-of new to say in that it attempted to demonstrate that John passed much of the problems he had with his father straight down to Julian. Christopher Fairbank plays a believable and sympathetic Alfred Lennon. But while Eccleston portrays a relatively convincing, enigmatic John, he is far less kind to the Beatle than Fairbank is to his father, presenting a self-obsessed, cruel megalomaniac who thinks he’s Jesus (Commodus anyone?). We have to admit, though, Eccleston does a good enough job, despite the grating scouse accent. What’s more, Alfred Lennon and John Lennon are two acting gigs which are poles apart: Fairbank has an awful lot of freedom to interpret Alfred and I can’t help feeling that he enjoyed filming this more than Eccleston, whose role demanded careful study and imitation, and promised more than a little mockery if not followed through successfully. Related to this point, it has to be said that Eccleston really shines as John when he’s portrtaying him in his private life, away from the toe curling Beatles’ banter with the press, which allows scarce little room for interpretation. Overall, this is a drama worth seeing, but one or two things annoyed me about it. Mainly, the use of archive footage of the Beatles. You’re filming a drama – make your own footage! I know, I know, you can’t exactly fill up a baseball stadium for a TV drama, but come on, we all know the Beatles and their music, we believe they were successful. This is a story of private lives, so why bother? The worst thing about the footage was that it also focused on shots of various Beatles and Yoko jumping in and out of cars and planes and things in the middle in the story. The problem here is that the veil of believability is torn down each time it happenes: just when you get into the swing of Eccleston as Lennon, they show you the real Lennon, and you think, ‘That’s what he looked like. I remember now’! And poor old Eccleston has to start from scratch. This is further added to by the fact that there are four Beatles and Yoko Ono for the viewer to accept, and the effect is the same for all of them. The one enigma (as always) is George Harrison. I wasn’t sure where Jack Morgan was going at all with this, although maybe it was a casting (or hair and makeup!) issue. Andrew Scott and Craig Cheetham play a reasonable Paul and Ringo respectively. We never hear of John’s death, only that he was not to return to the UK once settled in the States. One of the twists of Lennon’s life and untimely death which this drama highlights is his unfinished family business. In this portrayal, you can’t help but feel sorry for Alfred and Julian, and land a lot of the blame for the persistence of family difficulties on John himself, despite his difficult upbringing. Furthermore, the connection between three Lennon generations and the repeated mistakes highlighted here makes one wish that John had lived to an older age if only to feel the pain Alfred felt and understand and make ammends for his own mistakes, as Alfred tries to. By the way, and just for the record: Eccleston and Mori do get naked, just the once. Faults aside, a worthy addition to the Fatherhood season. Recently, the Comely Banking Crisis featured a post which, despite amounting to a selfless endeavour to share some quite extraordinary musical experiences, quite frankly fell flat. The problem? The music was far too obscure. And weird. And the taste, slightly disturbing. And I’m afraid this issue runs beyond the blog and into one’s personal Facebook activity also. Recently I tearfully shared knowledge of the death of the great Ronnie James Dio, a man who performed with both Rainbow and Black Sabbath – a truely lovely man with the voice of an angel (a heavy metal angel, obviously) – and got not so much as a ‘like’, lol, OMFG, or any such acknowledgement of shared grief. The man is credited with popularizing the ‘devil horns’ sign! The problem? Dispite Dio’s dinosaur stature in a particular sub-genre, too obscure again! On another dodgy musical front, this is Eurovision weekend! Where will you be? I know where I’ll be: at home, with friends, taking in the ENTIRE broadcast and attending my own glitzy after party. Love the Euro! Love the Eurovision! Because that is what’s wrong with Europe and the Euro at the moment: not enough Euro-love! This week is payday week, thank Christ! Eek, it’s been a five-weekend pay month! Holidays have to be booked, passports have to be renewed (I’d rather gouge my own eyes out), work has to be done, and above all we’ve had a fairly beautiful weekend in Edinburgh. Okay, Sunday wasn’t amazing all day, but generally there was plenty to draw one towards a beer garden. Despite this, one persevered with cans of Tennents in the flat with the window open. But we needn’t despair, Wednesday (like, right at the beginning of Wednesday, like Tuesday at midnight), one’s misery will end. But it hasn’t been misery, really, just a touch of end-of-the-month frugality to soften the hedonism of the first couple of thirds. Here are a few things I enjoyed. 1. Walking around outside. You can’t beat it. It’s free, normally healthy, and pretty in this city. 2. While doing same, popped into Leo’s Beanery on Howe Street for a gorgeous cup of coffee (one of a couple of indulgences which flew in the face the emergency budget). I fully intend to comprehensively review this place as I think it’s a hidden gem. 4. Yojimbo. I’m going through a mini Akira Kurosawa movie season at home with no strict order to it. Ran was recently watched and enjoyed. Samurai King Lear works. Yojimbo? Many people would say this is a masterpiece and subject it to careful criticism and analysis. For now, I’d rather just say I enjoyed it. I have to admit I fell asleep a few times trying to watch it last week, but that was entirely the week I had rather than the film. Finished it this weekend. Happy to recommend it. It’s a good, short, snappy film with a great soundtrack. I had been wondering what film to start my Kurosawa season with and Ran happened accidentally. Yojimbo would have been a better kick-off. 5. 500 Days of Summer. The Comely Banking Crisis does Lovefilm and this one was on the Icy Penguin’s list, with the former, Yojimbo, being on mine. We’re still digesting it but I think we both enjoyed it. We were both frustrated by the female character, but that’s kind-of the point of the film. A sort-of romantic comedy with a twist. It thinks it’s Amelie a little bit, without all the magic or Paris. Los Angeles is the setting and one of the things I enjoyed was the fact that the the male lead character is an architecture graduate who discusses LA and its architecture regularly. This led me to think about another film set there, In Search of a Midnight Kiss, a better film actually, also portraying a brief-ish relationship and very much referencing its Californian backdrop. But aside from these small mercies, we wait for the money! I love Michael Sheen. I can’t get enough of the man. His little face, his brilliant acting, that cheeky grin that can say ‘I’m a champion’ one moment and ‘I’m in misery’ the next. The man is a chameleon, a vessel for weird and wonderful Britons of the last hundred years. His deployment in so many iconic roles recently has been inspired. A truly great British actor. So it follows that I should host my own Michael Sheen Season! I’d like to call this my Sheen Season but that could be confusing (not that I’d begrudge anyone a Charlie or Martin season). I have to admit this wasn’t planned very carefully. It’s rather been an organic exploration testifying to the addictive property of the actor’s presence and work – you just want to go back for more. Most recently for us it’s been Ron Howard’s Frost/Nixon. This has been one of those big films that everyone cool says is great – a bit like Good Night and Good Luck – critically accclaimed, intelligent, big. It always takes me a while to get round to watching these. Maybe it’s War and Peace syndrome except on a small scale with movies: a big committment for a Friday night! Anyhow, we watched it and loved it. Sheen was great as hedonistic David Frost. We felt that Frank Langella’s Nixon was something of a caricature, but maybe this role demanded a bit of overplaying. Nixon has been caricatured so many times since his presidency that it’s the caricature that everyone remembers anyway. It was the right choice, because we forgot about Langella quickly and focused on his Nixon instead. A great, entertaining film that gives you just enough information on the background so that you can learn and enjoy. And Sheen? Perfect! The role doesn’t stretch him hugely, but that’s the role. Sheen has played Tony Blair twice. I would summarise these as Nasty Ambitious Blair in the 2003 TV drama The Deal and Great Guy Blair in The Queen. He’s best known for the latter, but I prefer the Nasty Blair of The Deal because its focus is on Blair himself and it’s a more thorough exploration of the man. And he’s portrayed as a nasty git! In any case, Sheen gets quite the accolade from me for doing two different Blairs, each one great. The Blair character promises a lot more screen time. We’re still waiting for War Criminal Blair, but I suspect that can only be done once the outcome of the current Iraq Inquiry is known and Blair is retired and we have a little distance from it. Perhaps Pierce Brosnan’s ex-Prime-Minister in Polanski’s The Ghost will take us part of the way there. I haven’t seen it but I don’t think a character played by Brosnan who merely alludes to a Blair-type figure is a sufficient third part of this trilogy. There’s a great movie in the Blair story yet. Anyone have any other recommendations? I still haven’t seen The Damned United due to my football-schmutball attitude, but I must get over that! Between the Scottish National Party‘s minimum pricing and Labour’s possibly more canny/sleazy, but now dropped tax plans for strong, cheap booze, alcohol policy has been bandied about a lot recently. While this area will not match in prominance economic and military issues in the upcoming Westminster elections, the debate will surely continue nevertheless. So to celebrate the ongoing Cameron/Brown rivalry (with a bit of Salmond and Clegg thrown in), I give you the Election Drink Off!! The rules are simple and flexible. Teams are formed and each must represent a political party. The easiest choice is to have three teams: Labour, Conservative and Lib Dems. Maybe for Scotland you could do SNP, Labour and Lib Dems, it’s up to you, but a good choice depends on the next feature of the game. You must choose a medium through which all parties will represent themselves in real time – the obvious choice is the leaders’ TV Debate on this Thursday, 15th April. Offcom and the Electoral Commission will ensure that the game is fair: political parties will be allowed equal exposure time. A referee is required. This blog strongly recommends that your own, no-rules political debate be held in the immediate aftermath of the drinking. The best bit about the game is that whoever is on David Cameron’s team will end up sh*t faced. There’s been a lot of talk recently about diaries. The BBC gave us a whole season on the subject, with illuminating programming which revisited the diary of Anne Frank, Roger Casement’s terrifically scandalous ‘Black Diaries’ and the undeniably fascinating journals of Kenneth Williams (pictured), among many others. Whether the concern is historical, such as with The Diaries of Tennessee Williams on Radio 4, or espousing the merits of writing one’s own and tips for so doing, exemplified in the Dear Diary series, the message is pretty clear: we like diaries and we should all write one. And then there are blogs – the public, showy-offy version. To say that blogs are de rigueur these days is so obviously an understatement that I needn’t even bother listing off recent examples; there are too many anyway. I’ll take it that you’re convinced. But aside from settling on what’s worth reading, we quickly reach a problem when confronted by the plethora of blogs now online – a neurotic and especially modern problem. What value is there in setting up yet another one, taking up that little bit more space, making the internet one blog more cluttered than it was before? Surely one could adequately fulfil one’s sacred duty to the improvement of the internet simply by abstaining from the whole business, just as one might help the environment by laying off the beef or staying at home more (in the cold with the lights off, of course)? Simply put, is the best kind of blog these days one that is never started? Well, aside from the obvious ‘just make it a good blog’ solution to this conundrum, I’m going by the principle given to me by the Beeb at the license fee-payers’ expense: that it’s good to write a diary, and by that I understand blogs too. Anyone (read: me) who’s concerned that blogging has become clichéd and that we are overexposed to the habit should wonder whether all of those ladies and gentlemen of yore who gave us all the great diaries spent a lot of time worrying about such issues when they were writing. I suggest that they didn’t. Nor should we. And besides, those yore-folk were too busy worrying about wars, God, untreatable diseases and the illegality of homosexuality. And as a final word in this little ode to the blog, I correct myself: blogs might well be public and ‘showy-offy’, but there is no reason to suppose that diaries are any less so. I grew up reading other people’s widely published diaries, for God’s sake. So, thanks Leither Magazine for setting up this timely blogging service which I now benefit from. And so I begin yet another one, but this one doesn’t waste paper; instead, they have a big engine in California or somewhere that powers hundreds of computers. Oh Hell, we can’t win! At least they’re more efficient with home heating over there!